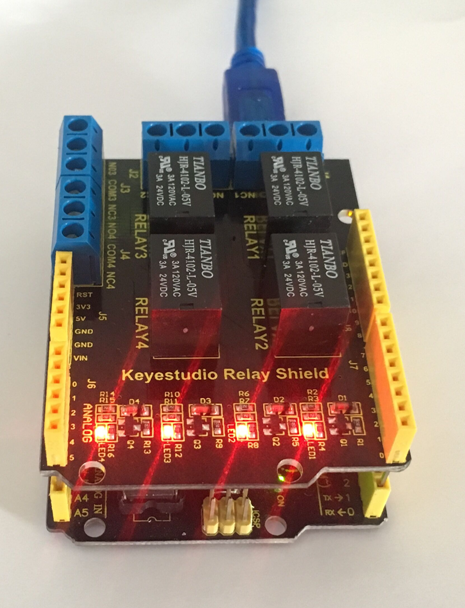 The keyestudio relay shield has integrated a 4-channel 5V relay module, which is fully compatible with UNO R3 control board. The 4-channel relay on the shield is active at HIGH level. 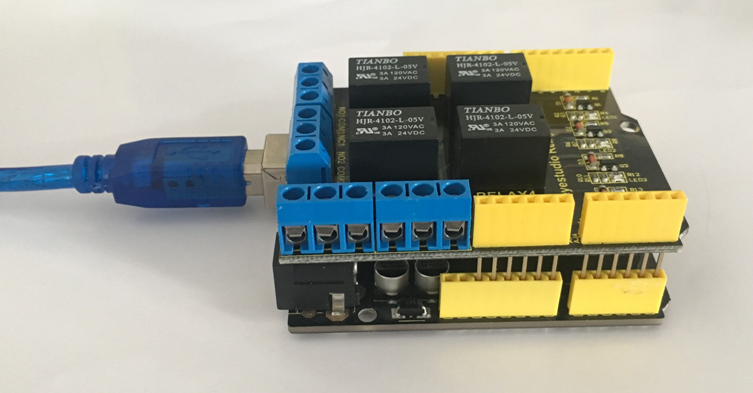 Separately connect the 4-channel relay to the digital port 4, 5, 6, 7 on the UNO R3 board, then through controlling output HIGH or LOW to control the relay on and off. 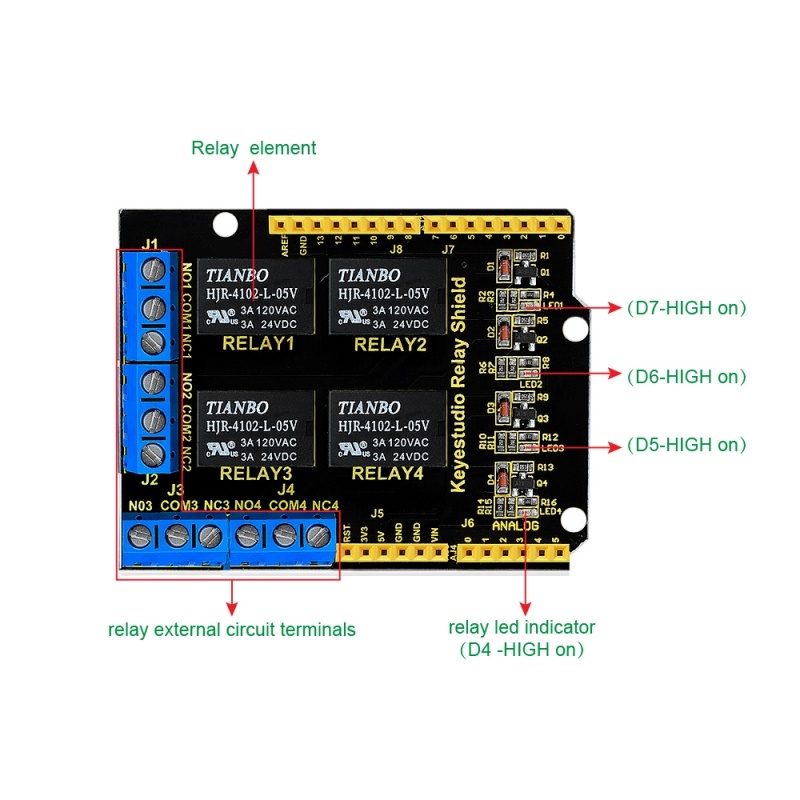 Indicator: 4 LEDs are red when the relay is driven high, the corresponding indicator will light up. Be able to control various appliances and other equipment with large current. Terminal high-power, high-current high voltage can be connected to the device. When D4 is High, RELAY 4 turns on, LED4 lights up, COM4 and NO4 connected, COM4 and NC4 disconnected. 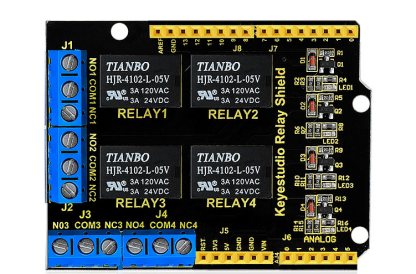 If D4 is LOW, RELAY 4 turns off, LED4 not light, COM4 and NO4 disconnected, COM4 and NC4 connected. When D5 is High, RELAY 3 turns on, LED3 lights up, COM3 and NO3 connected, COM3 and NC3 disconnected. 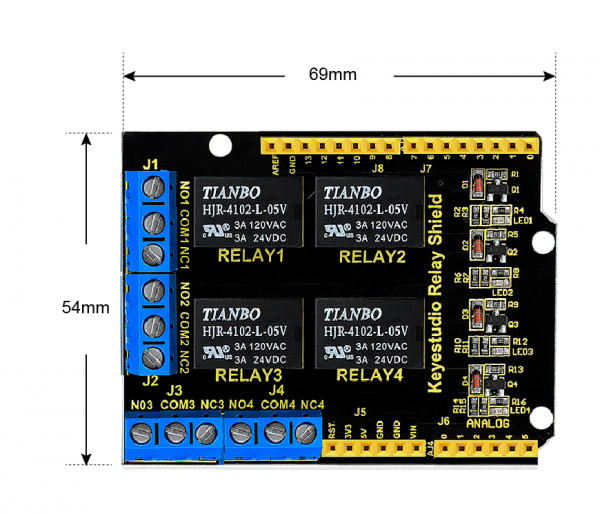 If D5 is LOW, RELAY 3 turns off, LED3 not light, COM3 and NO3 disconnected, COM3 and NC3 connected. When D6 is High, RELAY 2 turns on, LED2 lights up, COM2 and NO2 connected, COM2 and NC2 disconnected. If D6 is LOW, RELAY 2 turns off, LED2 not light, COM2 and NO2 disconnected, COM2 and NC2 connected. When D7 is High, RELAY 1 turns on, LED1 lights up, COM1 and NO1 connected, COM1 and NC1 disconnected. If D7 is LOW, RELAY 1 turns off, LED1 not light, COM1 and NO1 disconnected, COM1 and NC1 connected. Simply stack the shield on the UNO board . 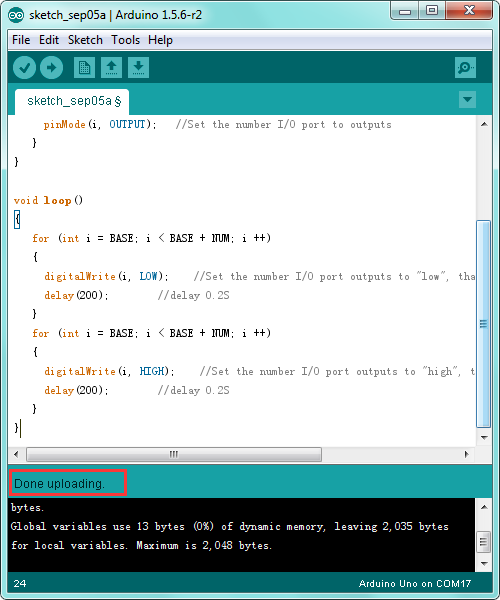 How to download and install Arduino IDE and driver. Click here to download the code or directly copy the code below to IDE. digitalWrite(i, HIGH);    //Set the number I/O port outputs to "high", that is, gradually turn on relay. Done uploading the above code, you should see the 4-channel relay is first connected, and then disconnected one after another, repeatedly.